German leader of society; born in Berlin Sept. 5, 1764; died there Oct. 22, 1847. 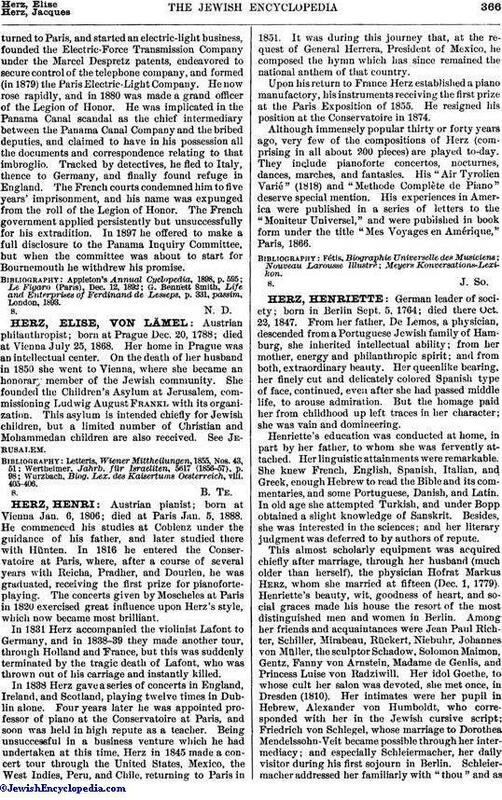 From her father, De Lemos, a physician, descended from a Portuguese Jewish family of Hamburg, she inherited intellectual ability; from her mother, energy and philanthropic spirit; and from both, extraordinary beauty. Her queenlike bearing, her finely cut and delicately colored Spanish type of face, continued, even after she had passed middle life, to arouse admiration. But the homage paid her from childhood up left traces in her character; she was vain and domineering. Henriette's education was conducted at home, in part by her father, to whom she was fervently attached. Her linguistic attainments were remarkable. She knew French, English, Spanish, Italian, and Greek, enough Hebrew to read the Bible and its commentaries, and some Portuguese, Danish, and Latin. In old age she attempted Turkish, and under Bopp obtained a slight knowledge of Sanskrit. Besides, she was interested in the sciences; and her literary judgment was deferred to by authors of repute. This almost scholarly equipment was acquired chiefly after marriage, through her husband (much older than herself), the physician Hofrat Markus Herz, whom she married at fifteen (Dec. 1, 1779). Henriette's beauty, wit, goodness of heart, and social graces made his house the resort of the most distinguished men and women in Berlin. Among her friends and acquaintances were Jean Paul Richter, Schiller, Mirabeau, Rückert, Niebuhr, Johannes von Müller, the sculptor Schadow, Solomon Maimon, Gentz, Fanny von Arnstein, Madame de Genlis, and Princess Luise von Radziwill. Her idol Goethe, to whose cult her salon was devoted, she met once, in Dresden (1810). 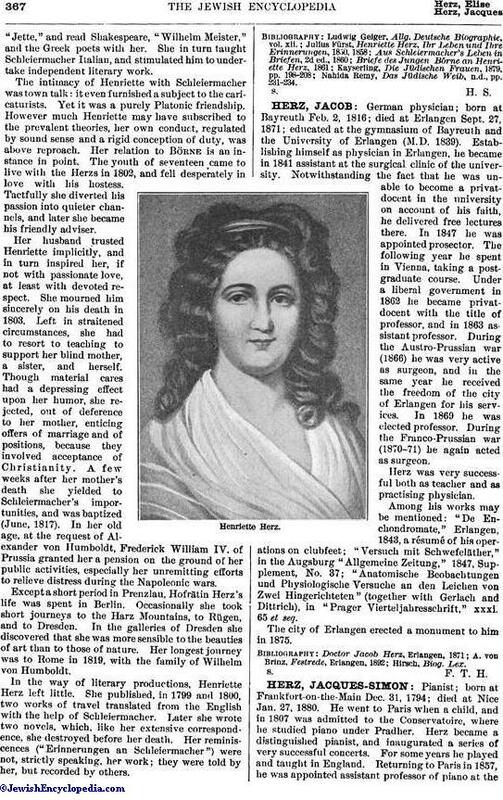 Her intimates were her pupil in Hebrew, Alexander von Humboldt, who corresponded with her in the Jewish cursive script; Friedrich von Schlegel, whose marriage to Dorothea Mendelssohn-Veit became possible through her intermediacy; and especially Schleiermacher, her daily visitor during his first sojourn in Berlin. Schleiermacher addressed her familiarly with "thou" and as"Jette," and read Shakespeare, "Wilhelm Meister," and the Greek poets with her. She in turn taught Schleiermacher Italian, and stimulated him to undertake independent literary work. The intimacy of Henriette with Schleiermacher was town talk: it even furnished a subject to the caricaturists. Yet it was a purely Platonic friendship. However much Henriette may have subscribed to the prevalent theories, her own conduct, regulated by sound sense and a rigid conception of duty, was above reproach. Her relation to Börne is an instance in point. The youth of seventeen came to live with the Herzs in 1802, and fell desperately in love with his hostess. Tactfully she diverted his passion into quieter channels, and later she became his friendly adviser. Her husband trusted Henriette implicitly, and in turn inspired her, if not with passionate love, at least with devoted respect. She mourned him sincerely on his death in 1803. Left in straitened circumstances, she had to resort to teaching to support her blind mother, a sister, and herself. Though material cares had a depressing effect upon her humor, she rejected, out of deference to her mother, enticing offers of marriage and of positions, because they involved acceptance of Christianity. A few weeks after her mother's death she yielded to Schleiermacher's importunities, and was baptized (June, 1817). In her old age, at the request of Alexander von Humboldt, Frederick William IV. of Prussia granted her a pension on the ground of her public activities, especially her unremitting efforts to relieve distress during the Napoleonic wars. Except a short period in Prenzlau, Hofrätin Herz's life was spent in Berlin. Occasionally she took short journeys to the Harz Mountains, to Rügen, and to Dresden. In the galleries of Dresden she discovered that she was more sensible to the beauties of art than to those of nature. Her longest journey was to Rome in 1819, with the family of Wilhelm von Humboldt. In the way of literary productions, Henriette Herz left little. She published, in 1799 and 1800, two works of travel translated from the English with the help of Schleiermacher. Later she wrote two novels, which, like her extensive correspondence, she destroyed before her death. Her reminiscences ("Erinnerungen an Schleiermacher") were not, strictly speaking, her work; they were told by her, but recorded by others. Nahida Remy, Das Jüdische Weib, n.d., pp. 231-234.